+ Jones and deputy recreation commissioner Elisabeth Draper were there to collect feedback to fold into planning for the park. Said Jones about the desire to draw on ideas from the public: "It will cost us as much to build a bad park as a good park." + About the cost: City officials say there's no budgeted money for the park, and they don't have a rough estimate yet of what it could cost. For some context: Syracuse built opened a new skatepark this year at a cost of $400,000. That city pulled together the money from its own budget, state funding, a neighborhood association, and a grant from the Tony Hawk Foundation. Jones and Draper said they were on the lookout for potential funding sources. And it sounds like details from the planning process will be used to bolster grant applications. + Though there's not yet a draft plan for the park, there is an outline for the idea: Four rundown tennis courts at Washington Park -- about 12,000 square feet -- would be repurposed for the park. This spot -- "The Blue Banks" -- is already a de facto skating spot. Draper mentioned the change in elevation at the courts could lend itself well to a skatepark. But that spot apparently isn't set in concrete. And Jones even seemed open to the idea of another skatepark somewhere else in the city. + The meeting was packed with skaters and many had ideas for what the park should -- or shouldn't -- include. Jones said he "strongly" supported the idea of a design committee to aid in designing the park. + Interesting idea that seemed to find favor with many of the skaters: Using the park to recreate certain aspects of spots in the city that are already popular with skaters, like the Soldiers and Sailors monument. + Ideas that didn't go over well: the possibility of having the park administered by an attendant, and requiring helmets. As one skater framed it, the park should be as easy as possible to skate at so that it's a more attractive options than other spots where skating isn't allowed. 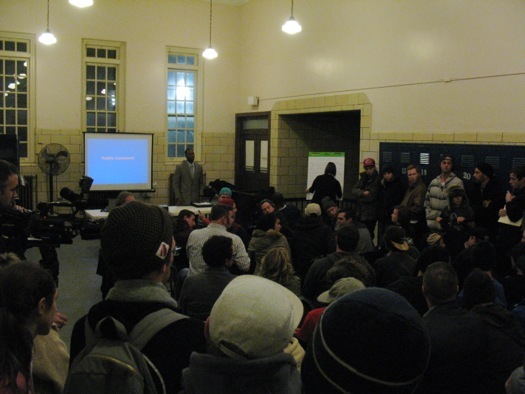 + The meeting was unusual, in a good way, in that seemingly everyone there was in support of skatepark -- skaters (obviously), reps from the Washington Park Conservancy and neighborhood groups, even a few (apparently non-skating) parents showed up to cheer on the idea. It'll be interesting to see if all that support can be channeled into finding the funding necessary, and arriving at a welcome design. Re: requiring helmets. I'm not a skater and have no first hand knowledge of the wisdom of wearing helmets. (Since I'm risk-averse, I imagine I'd wear one.) However, people are allowed to ride bikes on the Hudson bike path and nobody is required to wear helmets there. Isn't that city property for a good party of the bike path? How is this different? I assume it's bike/skate at your own risk. Does the city of albany have enough liability insurance when a skate boarder gets hurt at this park. Not to mention the noise for the residents around that area. MG: You live in a city. A skatepark could never be the main source of noise. If the city of Albany needs a point of reference for this project, then places like New York City and the state of Colorado should be looked at and taken into consideration. The New York City area (Five Boroughs, Jersey) have been building new skate parks every year. Skaters and bmxers from Albany are traveling three hours to skate and ride these parks because their built and operated right (skate and ride at your own risk/ no pads required). The same goes for Colorado. Skate parks are popping up everywhere and almost every town has a park and some towns even have two or more. For this reason, Skaters and riders from all over the country are now flocking to Colorado. From a business perspective, I'm sure this skate park boom is generating a lot of revenue for the state. This site is not up to date, but you get the idea. Soooo many parks! Nice coverage of this meeting. It was good to see so much support for the skatepark from different groups: skaters (obviously), the Washington Park Conservancy, and area neighborhood associations. @mg: Misconceptions about skateparks are quite common. Liability and noise are generally not the significant issues you suggest them to be. â€œâ€¦several recent noise studies, including those done by the City of Portlandâ€™s Noise Control Officer, have shown that skatepark use produces comparable noise to the measured ambient sound levels that already exist in parks, and it is not generally as noisy as a baseball field, or a basketball court." @ mg: You essentially don't need liability insurance beyond what Albany already has because New York State has something called The New York State Recreational Use Statue which almost absolves municipalities from lawsuits even when there is NO attendant. Think of it like "swim at your own risk" at a state beach or "ski at your own risk" at a state ski area. Besides, skateboarding is statistically less dangerous than major sports. And noise? Wood and metal ramps must be what you are accustomed to which DO make noise but almost the whole country now builds with cement which is MUCH less noisy and requires WAY less maintenance. Hooray for Albany to get this started!! Can't wait to skate the park as I'm 53 years young. I live, work, own property & pay a lot of taxes in the City of Albany. I don't skateboard at all, and I support building a skate park 100%. It should've been done 30 years ago.